I'm a sucker for these kinds of games (deja vu), where you get a whole slew of classic games on one disc. Midway pretty much pioneered this type of genre back in 1995 with the first arcade compilation dubbed "Williams Arcade's Greatest Hits", where you would get 6 games on one disc (or cartridge). Each year or so after that. Midway would release another collection with 6 or 7 games in one pack. While it's great to get into each set of classics at first, there's always the realization after a day or so that you only have six games, and they are pretty much older and archaic then the offerings available on consoles at that time. Many critics and even people have wondered why we haven't seen a large collection of games on a disc, seeing how disc based media can hold so much. Well, after about 5 or so compilations, Midway has finally outdone themselves by providing the biggest collection they've ever published. 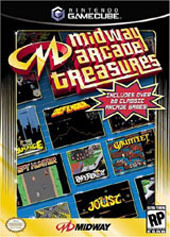 Midway's Arcade Treasures contains 24 classic games from Midway and the now-defunct-but-now-acquired-by-Midway, Atari Games. While we've seen most of these games in past collections (there are a couple of new additions), we have never seen them together in one package. Spy Hunter, Defender, Defender II, Gauntlet, Joust, Joust 2, Paperboy, Rampage, Robotron 2084, Smash TV, Bubbles, RoadBlasters, Blaster, Rampart, Sinistar, Super Sprint, Marble Madness, 720, Toobin', KLAX, SPLAT!, Satan's Hollow, Vindicators, and Root Beer Tapper. A very solid and diverse collection, indeed, but I'm still pissed that they have not included S.T.U.N. Runner in one of their collections! Midway does hold the rights to it, why must I still be tormented? Maybe next time in another collection, and hopefully bring along some other games such as Hard Drivin', APB, Cyberball and even Mortal Kombat (hard to believe it's over 10 years old!). Okay, let's get something out of the way here; it's hard to review a compilation package. I think I've said this before when reviewing Sonic Mega Collection. Seeing how these kind of games are not up to par with current generation graphics, sound and even depth, it's tricky on how I could evaluate this type of game. So I'll have to really base everything on how good the emulation is, as well as the presentation and even the collection itself. I will also have to consider current generation technology, even though it seems unfair in some way. The most important thing about a compilation is the emulation. These games were originally developed on unique and different arcade boards, so each game requires special attention so that they would work correctly in the collection. Past Midway collections have suffered from varying quality. For example, Midway Collection 2 for the PS1 back in 1997 was fairly consistent in quality and stability. But 1998's Atari Collection 2 for the PS1 had glitches that made the sound strange, and even trigger spontaneous pauses (mainly in Marble Madness). But Arcade Treasures seems to be the most tuned and consistent collection to date, where every game pretty much runs at full speed with out odd glitches and look as they should. Some games do have some volume issues (some games are louder than others), but all games do sound like they should, even better than how they were in past collections (RoadBlasters is one game in this collection that has seen an improvement over the last time it appeared in a previous collection). Now, even though the emulation may be right, how does it play on a Gamecube controller? I was a bit concerned that some games wouldn't translate well onto this system control-wise, such as Smash TV or Robotron 2084, due to the GC's button layout. But Digital Eclipse did a suprisngly good job on adapting all of the games to suit the needs of the player. The two games I mentioned earlier (Smash TV and Robotron 2084) are mapped appropriately to the controller, by having character movement with the main analog stick, and firing with the C-stick. I think it's even truer to the arcade versions that way, since I believe those two games might of had two arcade sticks originally. Maybe I'm wrong on that, but the point is it fits. Some games are mapped in a way I would have never thought of, but make sense. RoadBlasters is one of them. Here, Digital Eclipse mapped the gas function on the R-trigger. Again, they've made great use of what's there. But some games in the collection are more of a hassle than they should be control-wise. Vindicators is one of them, as you don't have control of the vehicle as one whole part (like a car), but you use one stick to move one tread and the other stick to move the other tread. It takes some getting used to, but the game is playable. Toobin has some of the same problems as Vindicators when it comes to control, but instead of treads, it's paddling. Spy Hunter has way too many functions to memorize, and the special weapons seem to be tossed anywhere on the controller. The current version of Spy Hunter was easier to play than this emulated version. Then there are some games that just don't seem to control right at all, maybe due to perspective. 720 and Paperboy seem to be the trickiest to control for me. Paperboy in this collection just never seems to enable you to reach your quickest speed or brake quickly to avoid obstacles. It's playable, but it's a bit trying in doing so. 720 seems to suffer the most in terms of control. The skater never can really reach full speed, I can't get him pointed anywhere where he's supposed to go, and the trick system is a bit unresponsive. I remember having the same problem in a past compilation, but it's even worse here. Most will handle correctly, just take note that some games will be trickier to play than others, either due to a more complex scheme or just bad controls. Graphics. What can we say about them here? Nothing is in 3-D (some games such as Marble Madness fake it by perspective, but it's still 2-D since you only see one side), and nothing much really surpasses what we see on the Game Boy Advance. I guess it's safe to say that most of the games are very much how they did look in the arcades. Some games, such as 720 and Paperboy do suffer from a bit of washed out color, but most games do look pretty sharp. None of the games really suffer from slow-down. I heard that the PS2 and X-Box versions of MAT had some slowdown in Smash TV, but I have not at one time seen slow down in the GC version. It seems like whatever kinks arise in the graphics of the previous versions of MAT have been ironed out in the GC version (of course, the GC version was delayed, too). Some games still do have a certain charm to their look, that even with today's technology, they still seem to look good. Marble Madnesss, RoadBlasters, Klax, and Smash TV are some of them. Then other games were never that great. Rampage being the biggest disappointment, not because of emulation, but because of how it looked originally. This game was made in 1986, but looked like something from 1983. It looked so archaic and simplistic even for that time. The sound is pretty much a duplicate of what you heard in arcades. All the sound effects and music are there, and it's pretty clear in almost every game. The weird crackly sound in the music of RoadBlasters in Atari Collection 2 has been cleared up this time around. Some games do operate at different volumes for some strange reason. Klax will be loud, but I had to turn up the sound for Sinistar. Other than that, there's not much to complain about. Even though these games are over 15 years old, they still have a lot of great game play to offer. That being said, Midway's Arcade Treasures is a great value. Even though we've seen most of these games in past collections, they're finally here all in one package, and at a very reasonable price of $19.99. You may not like all of the games, but I bet a lot of people will find at least 6 or more games that they will like out of here. Plus, it does offer something for everyone of all ages. What's also great is that some of these games have multiplayer functionality, such as Gauntlet, Rampage, Super Sprint, Smash TV and a few others. I am, however disappointed that there isn't a whole lot new in this collection. Vindicators, Rampart and Satan's Hollow are new and never have been in previous collections, but to me that's not enough. I'm still waiting for S.T.U.N. Runner to appear in one of these compilations, and it wouldn't hurt to see Hard Drivin, Cyberball, APB and even Mortal Kombat in the compilation. It also would have been nice to toss in a unique game in each version of this game. Seeing how Nintendo and Midway had a joint venture in Cruisn' USA back in 1994, that would have been a great exclusive to see in this package. But that's just me. I always want more. As it is, Midway's Arcade Treasures is one of the best compilations to come around in quite some time. It's not perfect, but it still has a lot of timeless game play to offer. Almost every game here has been seen on previous collections, but it's nice to have everything on one disc, and for only $20. There's a lot of solid hits to warrant a buy.